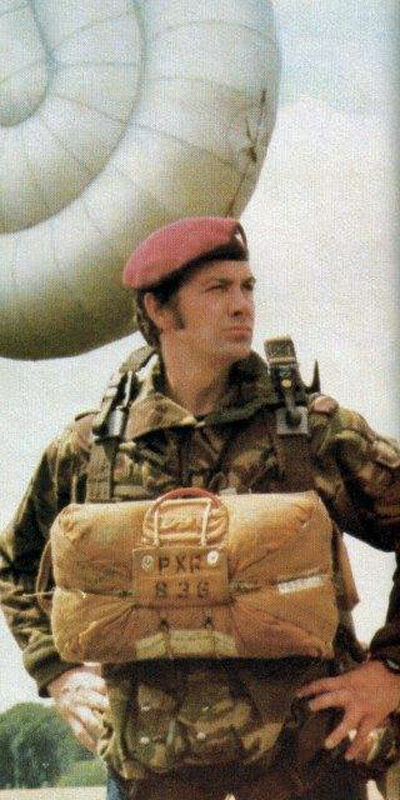 Lewis Collins joined 10 Para in 1979 here are the photos of him on his recruit selection which he passed that at the age of 33. A magnificent achievement he was very fit and performed all his Para selection in a competant manner even under pressure that his stardom had caused him. He got no favours from the staff instructors and he took all our wind ups with a bit of fun as he had a sense of humour that saw him through. I take my hat off to him for his efforts during his course. 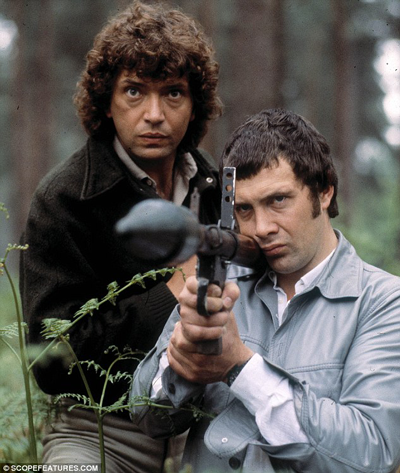 Lewis at the time had played Bodie in the TV Series the Professionals and was about to make the film Who Dares Wins. Lewis died in November 2013 after a five year fight with cancer. I have stayed in touch with him up until his death. Some 33 years of friendship as the Airborne Brotherhood have with each other.. Rest in Peace Lewis dear friend and a nice guy to know. But his tough-guy persona was no act. Collins was super-fit, a part-time paratrooper from the docks of Birkenhead. After the show ended, he applied to join the Special Air Service, and passed the initial selection stages for the territorial unit 21 SAS, before senior officers ruled that his celebrity status made him a security risk. I first met Lewis when I served as a sergeant with 10 Para Recruit Training Wing. It was either Nov 78 or Feb 79 as neither of us could remember. Lew had came to do his Parachute Regiment recruit selection. I was one of his Selection and Training Instructors. His course ran for three weekends at the Finchley drill hall and then a fortnight straight off at St Martins Plain Folkestone Camp. It was not a holiday camp that was for sure. This course saw one of the coldest winters. I had known in my 5 years on training wing. it was very much the survival of the strongest and the fittest both physically and mentally. At the time Lewis did his selection we started with about 120 persons.. At the end of the course we had about 40 left of which about 25/30 passed. Lewis being one of them. He got no favours from the staff and the pressure on him was more than others due to his fame. He passed on his own merit. Lewis had a great trainer to thank Colour Sgt John Newman who is here with me today John prepared Lewis for his course well. John spent a lot of time with him getting him fit and in the right frame of mind. It paid off for both of them both a credit to the regiment. At the camp I remember his excellent fitness especially on the 10 mile battle test march with 40 Lbs of kit on his back. We marched from Dungeness Lighthouse to Hythe ranges along the seafront in one hour and 43 minutes in a biting wind sea spray peebles hitting us in the face with sleet and hailstones. To Pass he had to stay with me he did that all the way. Although he got tired he showed me determination that was the qualities I was looking for. His final exercise was 24 hours without sleep despite laying in an icy swampy field soaked through for most of it on top of the Folkestone Cliffs Area with the biting wind and of course our many offers for him be give up were not taken up by Lewis. I remember seeing him shivering in the trench he had dug at 3 Am. He refused again to quit carried on remained chirpy and his humour had helped the other guys he was a team player. We then went on and did all the famous P Coy things such as telegraph pole races stretcher races and the swampy assault courses . He passed them all with great impression on the staff. He was 33 at the time and to do that I take my hat off to him. Many younger guys failed that course. We crammed in to Lewis many skills. He absorbed them well and was quick and keen to learn. On the humour side I remember. gassing him in the tear gas chamber where I wanted to see him if he was a real actor he removed his mask and done a bit of Shakespeare for me. It brought tears to his eyes not mine . A lovely sad scene on the cliff as he stood in the wind crying his little heart out hoping the wind would blow the tear gas away. We then both burst out laughing. He lasted longer than the tax inspector I had in the gas chamber as well. We were practising attacks and going over coiled barbed wire for this we needed a professional so it was Collins on the wire he did that and dived on it without hesitation after 29 men run over his back the last two pulled him off the wire with some help from others again he was laughing. 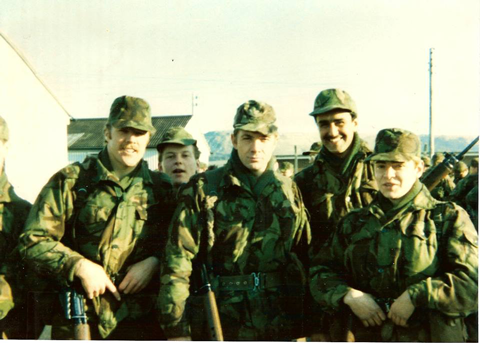 Our role in 10 Para at the time was if the Russians invaded a Nato Country we were to deploy by Parachute to an area to attempt to delay them for 48 hours so that the rest of the Army could mobilise. That was what Lewis and all of us had volunteered for. To do his bit for this country knowing the risks is a credit to him. I knew that if War with the Russians did kick off I would willingly have him in my platoon for real as I could rely on him for his skills and humour. For me he passed with flying colours. I thank him for sharing his life with me until the present day. Finally On behalf of all the ex members of the 10th batallion the Parachute Regiment and from the wives and girlfriend section of which 2 are with us today to represent them We send all our love and healing to the family. The family can all be proud of his Parachute Regiment achievements. You are never forgotten Lewis. Rest in peace.